The girls were off to Brownie camp and I was in possession of a rare jewel which is seldom seen around these parts: a free weekend. As is traditional when I’m presented with such an opportunity, there was a large low pressure sitting off the west coast. Further North was better, the weatherman said and who was I to argue? It wasn’t long before I was duelling with the A9 dualling. The Cairngorms drifted gently by at 50mph, obscured occasionally by empty JCBs, temporary traffic lights and unmanned work sites. The tops were clagged in under a gloomy sky. By the time I’d passed Inverness things were looking up, and for a moment I pondered carrying on to Ullapool and beyond, but at the last minute slung a left at Kinlochewe and found myself in Torridon. I’d had half an eye on a summit camp on Beinn Damh for a while, so why not today? The name of the hill was appropriate, I was frustrated to Jack Bauer levels of exclamation. The cloud sat low on the slopes and there was a decent wind even at sea level. 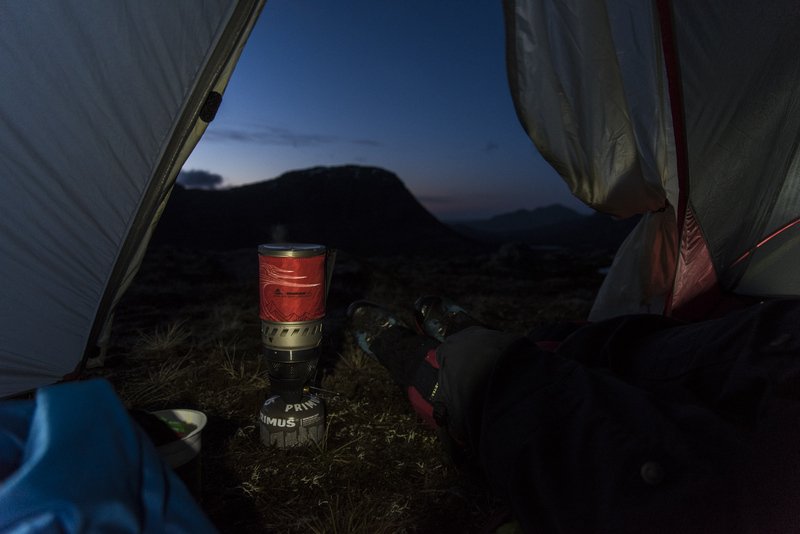 The prospect was one of battling a pole-rattling night in a tent for no view. Normally I’d give it a punt, but at least the last dozen summit camping trips have ended with me traipsing downhill the next morning with a tent bag full of rainwater and a camera memory card full of bugger all. I wasn’t in the humour. I weighed my options. I could carry on further North prospecting for opportunities, or I could go exploring with no fixed agenda. My arse had had enough of the car, time for Plan B. The last time I was up on Liathach, a few years previously, I came down the back way and wandered along the trail through Coire Dubh Mhor. 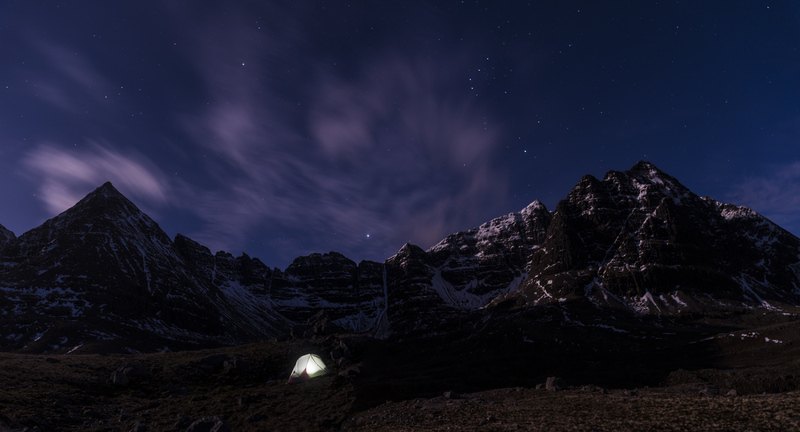 At the time, Coire na Caime had drawn my interest and I lodged a wee mental note to maybe come back and camp there one day. Today was the day. 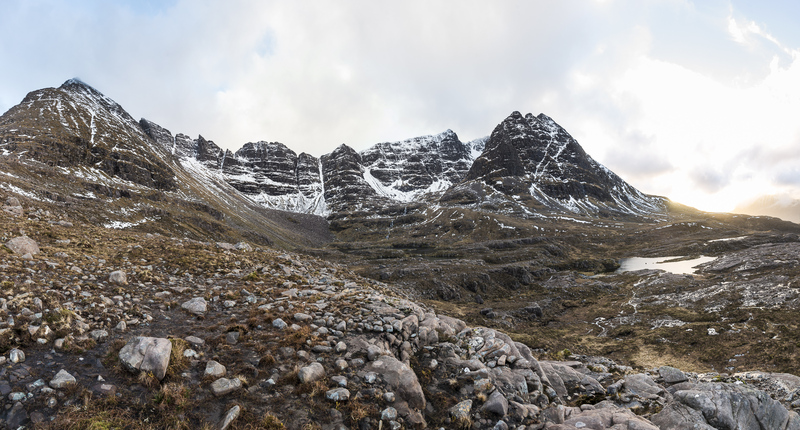 I walked in sun initially, and then into the cool shade of Liathach and gently upwards towards the coire. The boulders got bigger until they were car sized and I got slower as I picked my way through. I stumbled round a shed-sized block to surprise a small group of deer. The wind whistled up over the ridge, but I was in a calm and cool place. 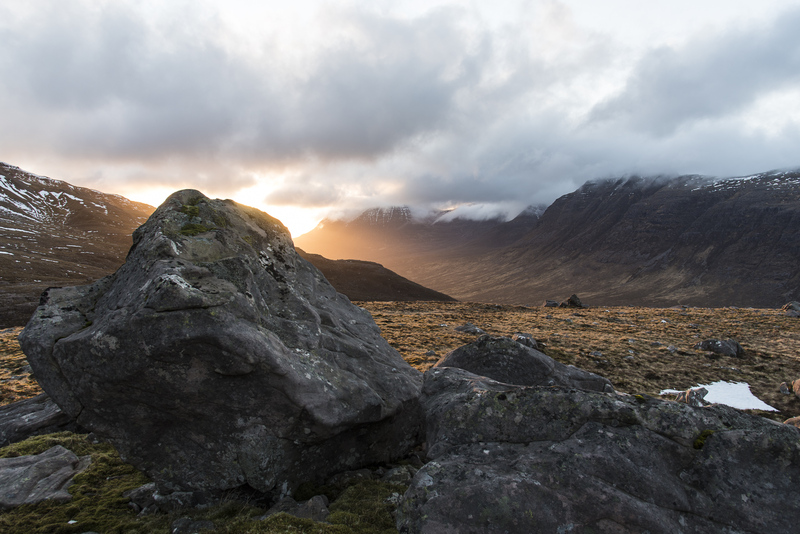 The sun was slowly descending towards the small bit of sea that was visible at the end of the glen. I was in no rush and had no summit to dash for, so I stopped regularly to soak up the silence. The views were more restrictive than my usual highpoints, but they were views none the less and that put them well ahead compared to my last few outings to the land of cloud. I targeted a ridge line above me and when I broached it, I stopped in my tracks. The coire was even better than I remembered, it was like stepping into the Lost World. The snow melting above was feeding the lochan and the burn that ran out from it tinkled gently in the cool air. Flat grassy platforms abounded, like a campers paradise. To add to the moment, an icy section detached itself from the ridge above and clattered down, a mini avalanche from a thawing mountain. I wouldn’t have been surprised to see a pterodactyl circling above. I wandered around until near-dark, exploring and enjoying. Eventually I selected a soft grassy spot and stuck the tent up and got the stove on. 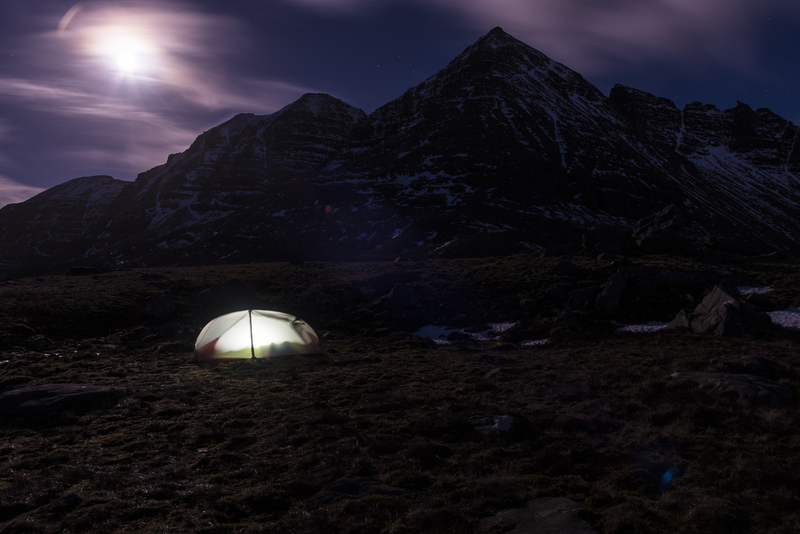 I settled in with some food and a hot drink with the door wide so I can see the light fade over Beinn Alligin. The wind increased and buffeted the tent, and for the umpteenth time that day I was glad I wasn’t on the tops. Maybe I’m getting lazier or wiser. Hard to tell, but I was happy. The night was bright and full of wonders. It was late when I settled in to my bag but I still woke before dawn. I was roused by a dream where people were walking around my tent, talking in low tones. My panicked brain waking me abruptly. It’s not the first time I’ve had that one. Dawn was gentle and muted. Beinn Alligin looked majestic, but the clouds scudded over the top like a freight train and I knew the rain was on it’s way. 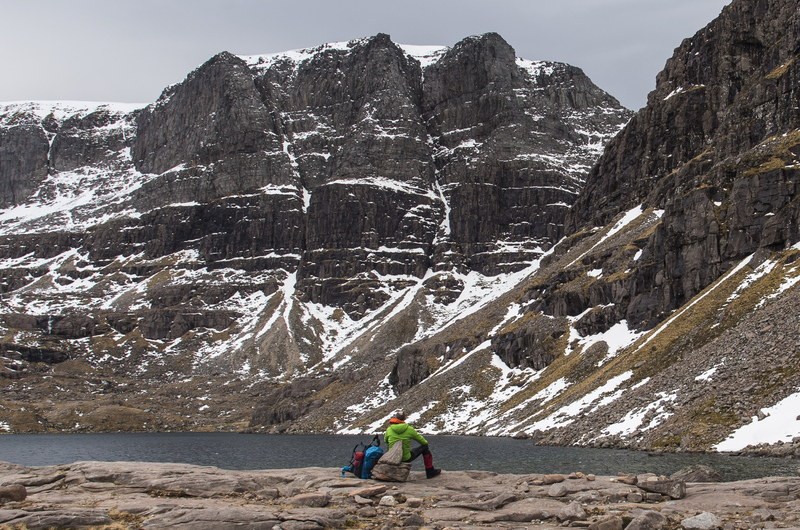 I porridged and coffeed and packed up for a wander over to Beinn Eighe. It had been twenty years since I was last at the foot of the Triple Buttress. I won’t make it so long next time. 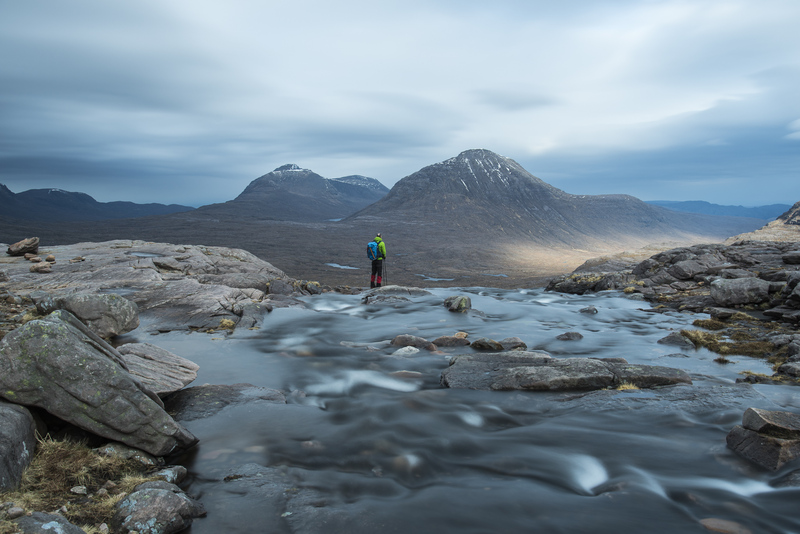 I had done the unthinkable, I had a free weekend and rather than spending it battering up steep peaks, perching on lofty summits and scrambling icy ridges, I had spent it stravaiging through some wild coires. If I had the decision to make again, I’d do exactly the same. Outstanding photo's and a grand sounding trip. I'm only mildly jealous! Thanks Sandy. Nice to see you're getting out and about too, even if not entirely to plan! Brought back happy memories of expploring the Liathac and Ben Eighe corries back in the 1970s. Now living in Australia so really enjoying reliving my mountain frolics in the west highlands with your blogs. 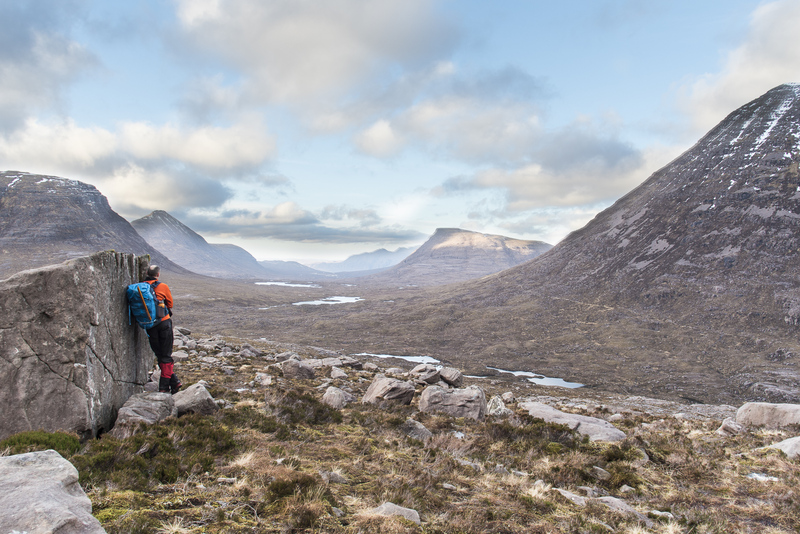 I've been toying with a Torridon trip for a while (the only thing in the way is an insane 9 hour drive) but you may have just sealed the deal. Excellent images and write up.